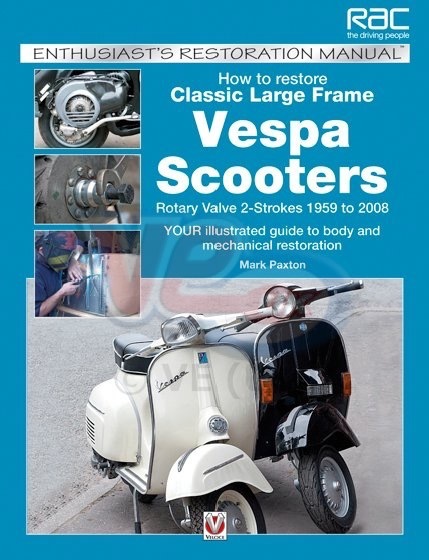 VE00467 RAC BOOK - HOW TO RESTORE CLASSIC LARGE FRAME VESPA SCOOTERS - BY MARK PAXTON This practical book guides the DIY enthusiast through all the stages of restoring a classic 2-stroke Vespa, taking it from a rusty unroadworthy wreck back to its factory fresh. It shows how to assess wear in all mechanical components, then assists in deciding the best and most cost effective method to renovate or repair. Brakes, suspension, electrical systems and brightwork are all addressed, from changing a bulb to welding in a new floor pan. An essential reference for all Vespa enthusiasts.